For an in depth elucidation of acute bacterial meningitis, watch this medical video lecture on sqadia.com. This V-learning lecture allows you to have a deep understanding of meningitis of bacterial origin. Our medical specialist comprehensively talks about causative agents of meningitis, how the disease progress and reach a serious stage. Likewise, the clinical presentation is also discussed along with the diagnosis via broad-based bacterial polymerase chain reaction, latex agglutination. Dr. Saima Mushtaq also sheds light on treatment option which can be done through empirical antimicrobial therapy, specific antimicrobial therapy, and adjunctive therapy. Amongst the various acute infections of nervous system, acute bacterial meningitis is discussed primarily in this section. Meninges, subarachnoid space, and brain parenchyma are involved in meningoencephalitis. Epidemiologically, organisms responsible for causing the disease are elaborated. Our medical specialist explains etiologic factors in detail. 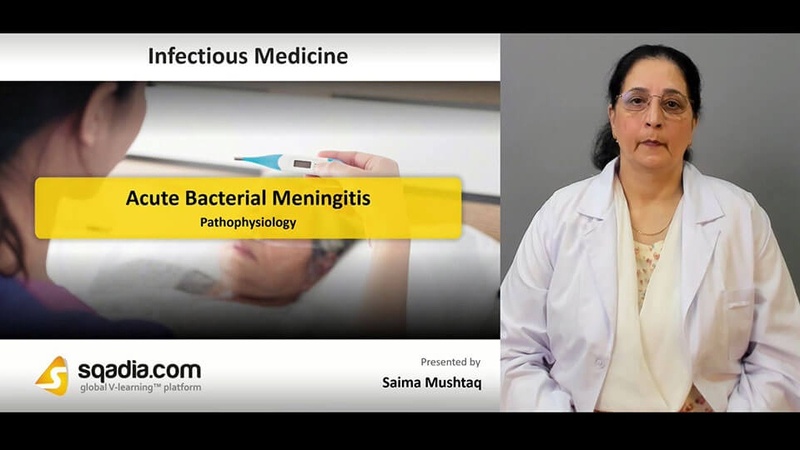 Initially, Dr. Saima Mushtaq talks about common causative organisms along with the pathophysiology. Then light is shed upon pathogenesis in which critical event, neurologic manifestations, and neurologic injury is discussed. Next, induction of inflammatory response, chemokines and cytokines comes under consideration. Medical specialist at sqadia.com V-learning also explains the early stages of meningitis. Clinical triad of meningitis follows fever, headache, and nuchal rigidity. Initial presentation is the seizures which is of two types i.e. focal seizures and generalized seizure. Signs of increased intracranial pressure are discussed later on. Meningococcemia and skin lesions are the clues to the diagnosis. Dr. Saima Mushtaq gives an insight to neurologic complications of bacterial meningitis through a detailed flowchart. Diagnosis is carried out by obtaining blood cultures, empirical antimicrobial therapy. Alongside, CSF glucose concentrations is highlighted. Broad-based bacterial polymerase chain reaction detects small numbers of viable and nonviable organisms. Latex agglutination (LA) test, Limulus Amebocyte Lysate Assay are also considered. Information about rocky mountain spotted fever is also given. 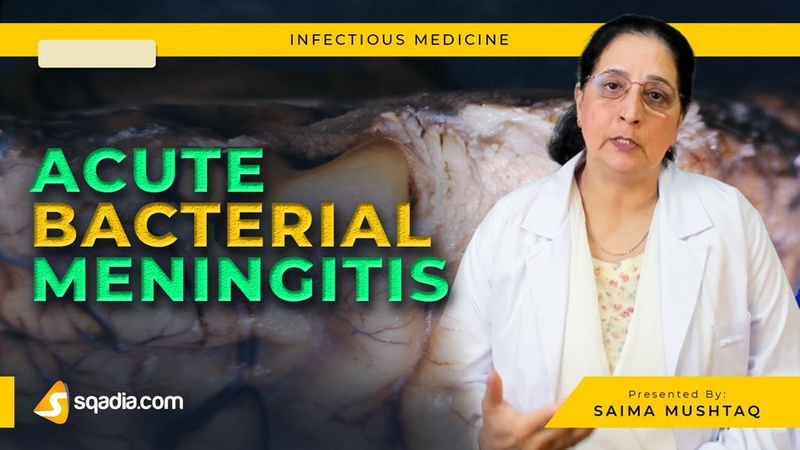 Moreover, Dr. Saima Mushtaq notify about ehrlichiosis, focal suppurative CNS infections and non-infectious CNS disorders. Empirical antimicrobial therapy, specific antimicrobial therapy, and adjunctive therapy are the treatment options for acute bacterial meningitis. For pneumococcal meningitis, therapy can be modified. Listeria meningitis can be treated by giving ampicillin for at least 3 weeks. Treatment of staphylococcal meningitis, gram-negative bacillary meningitis, and increased intracranial pressure is also elaborated in detail. Information about prognosis is also enlightened.